The brakes on your car are some of the most important safety features available for you to use. It is vital to keep your brakes well maintained and replace the brake pads as needed. Not sure where to start with brake maintenance? Here are some tips to keep your car running properly and safely. You’ll know when the brake pads need to be replaced when you hear a high pitched squealing noise every time you use the brakes. A small metal indicator will eventually touch the rotor when the brake pads have worn down too low to continue to be effective. In some rare cases, this indicator can break off or wear down to the point that it does not make the noise alerting you to change your brake pads. You can still tell the brake pads need to be replaced if you notice it takes longer to come to a complete stop or you have to push the brake pedal down further than usual in order for the brakes to engage. The rotors typically do not need to be replaced nearly as often as your brake pads. Rotors can develop grooves that can cause new brake pads to wear out quicker and can cause your tires to wobble. Sometimes, you can have them removed and ‘turned’ in order to smooth them out again, but if the rotors are worn down too much they’ll just have to be replaced. If you need your brakes inspected and the brake pads replaced, call Rolling Auto Service today. 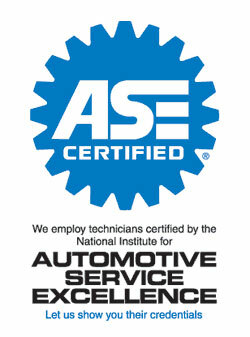 Our team of automotive specialists will have your vehicle improved in no time. Don’t have time to go to a local auto shop? Rolling Auto Service will come to you for automotive repairs right at home in Venice, FL. Posted in Uncategorized on September 14, 2016 at 4:29 pm by Rolling Auto Service.